CAMP LUKBAN, Catbalogan City, Samar – Her Excellency President Gloria Macapagal-Arroyo visited the interior municipality of San Jose de Buan, Samar, Friday morning. Aboard presidential chopper, PGMA landed at San Jose de Buan Elementary School quadrangle where all students, teachers, parents, local officials, PNP and Army were excitingly waiting. The visit of PGMA in SJDB gave more encouragement to the localities since the said municipality is still a developing municipality. PGMA inaugurated six (4) KBP projects such as the two (2) units of school building, two (2) health centers and two (2) street lighting projects, all constructed by the Army Engineers since civilian contractors hesitated to accept the said projects because of security concerns. It can be recalled that SJDB was known to be highly influenced by the terrorist NPA about few years ago where encounters between the terrorist and the military were just ordinary. Mayor Melania Rebato attributed the new SJDB (as what she described) to the military and PNP who untiringly performed their mandated task to secure their people and municipality. She especially mentioned the Social Integration Program (SIP) of the government that gives second chance and a new life to the former rebels. She also said that if she will assess the improvement of peace and order in her municipality, she is assured of about 70% to 80% better as compared to the previous years. She also stated that with the cooperation of the localities and the local officials to the law enforcers and to the military, development in SJDB was given priority. Improvement of access roads and highways are another projects being hoped for by the mayor for according to her, the economy of his municipality will continue to boom if they have more improved roads and highways. Meanwhile, Major General Arthur I Tabaquero, commander of Army’s 8th Infantry Division who is operationally responsible for the peace and order in Region 8 said in a separate interview that his Division will continue to make necessary actions in order to totally eradicate causes why development is hardly infused in the area. “Through the 34th Infantry Battalion, your Army will continue to coordinate with the municipal officials so as the peace and development is concerned”, MajGen Tabaquero added. “The only factor that affects why a certain place is very hard to develop is the peace and order situation. And now that the support of the civilian entities and other stakeholders are visibly seen and felt, we can guarantee that the insurgents in the area are soon be dismantled”, he sounded. He also said that PGMA might not have inaugurated KBP projects in San Jose de Buan if the people allowed the local terrorist group to sabotage and destroy all equipment and materials during its implementation. “May I take this opportunity to bring forth to other community to call for their continued share of support in order to totally achieve our prime goal in the province, and that is development”, Major General Tabaquero concluded. TACLOBAN CITY – President Gloria Macapagal-Arroyo ordered the immediate repair and improvement of the 39.5 kilometers Lokilokon-San Jose de Buan dirt road. President Arroyo made the directive during her March 19 visit to the hinterland town of San Jose de Buan in the province of Samar, the second poorest municipality and the most nutritionally poor municipality in Region 8. Presidential Assistant for Eastern Visayas Cynthia Nierras informed the Philippine Information Agency that the President has directed Defense Secretary Norberto Gonzales and 8th Infantry Division Commander Arthur Tabaquero, the Army Engineer Brigade and Samar Governor Mila Tan to coordinate with one another in order to fast track the rehabilitation and the improvement of the dirt road into an all-weather road. 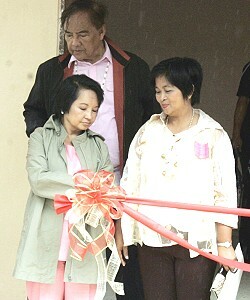 Samar Governor Mila Tan, PA Nierras said, told the President that the project would be finished in fifteen days. For her part, Second District of Samar Congresswoman Sharee Ann Tan said that she will facilitate the release of P5 million for the project. The President, however, ordered the reassessment of the road situation. “So it’s really the road that is hampering peace and development in this municipality,” the President was quoted to have said. PA Nierras informed that the project is estimated to have a total cost of P44.5 Million. When interviewed after the Presidential visit, Mayor Melania Rebato of San Jose de Buan, expressed her gratitude for the President’s visit. She said she has always believed that President Arroyo will not turn down the LGU’s request for the repair and rehabilitation of the one lane dirt road. The President’s visit has inspired the people and gave them a brand new hope that at last their road problem would soon be solved, Mayor Rebato said. Mayor Rebato said that she will prepare as soon as possible a letter requesting the DND to help the municipality solve its problem. The letter will be personally handed to Secretary Gonzales by PA Nierras. When the road is improved, the travel time to San Jose de Buan will only take more than 35 minutes, a far cry from today’s travel time of nearly three hours, from the Lokilokon Junction to the town proper of San Jose de Buan. CATBALOGAN CITY – More than 30 beneficiaries of the Pantawid Pamilyang Pilipino Program (4Ps) from San Jose de Buan, a town located some 70 kms from Samar’s capital city, are thrilled to see President Gloria Macapagal-Arroyo, their latest letter sender. In yesterday’s Presidential Visit, the 4Ps folks wearing white t shirts, converged with the welcoming party assembled at the municipal grounds for a rare glimpse of their ‘pen-pal’. Marina Rebato, 45, from Poblacion is excited to share that only a few were given the ‘presidential letter’. The first time she got her 4Ps cash grant of P3,800 she bought a sack of rice, some vitamins for her young kids, fruits which her kids can only see during Christmas and fiestas like apples and oranges. Her husband is a farmer who grows kalinayan (upland rice), rootcrops and vegetables. Like other beneficiaries, they are also ever compliant of the conditions, lest they be disqualified or suspended like the one mentioned by 4Ps municipal link Dong Bernados. In fact, to show they deserve the cash grant, as initiated by Barangay Chairman, they have planted veggies in their own backyards like pechay and upo. They have made the vegetables grow very healthy with the mustasa’s leaves growing almost a meter-long. The President, wearing a peach pant suit with brown hood smiled and waved at the crowd, in response. Come March 23-24, their shout might even become louder as they will again get their second cash grant for four months! CAMP LUKBAN, Catbalogan City, Samar – The Army’s 8th Infantry Division recovered two (2) high powered firearms and killed one New People’s Army (NPA) in a two separate encounters in the municipalities of Mac Arthur, Eastern Samar and Las Navas, Northern Samar, yesterday. In Eastern Samar, troops under 1Lt Mario Josue, commanding officer of the 14th Infantry Battalion’s Alfa Company were conducting community works when they received a text message from an unknown sender that some armed members of local terrorist group will be conducting extortion activities in the nearby barangays. 1Lt Josue allegedly proceeded to the mentioned barangays to provide security. Around 5:45 in the morning when they reached the boundary of Brgys. Magsaysay and Roxas both of MacArthur, Eastern Samar where they encountered some five (5) armed men who believed to be members of SSk1, SECCOM NE, ESPPC of the Eastern Vizayas Regional Party Committee (EVRPC) under Gavino Guarino alias Mael crossed their way that immediately resulted to a firefight. After about 30 minutes of firefight, rebel scampered to different directions leaving one dead unidentified rebel and one (1) M16 rifle with three (3) magazines containing live ammos. No reported hurt in the government troops. In Northern Samar, an M16 rifle was also recovered by the government troops when the elements of Charlie Company, 63rd Infantry Battalion led by 1Lt Tuguinay Agoy responded from the civilian’s tip regarding some unidentified armed men that were conducting extortion activities in Brgys. Capoto-an and Sagod of Las Navas. This resulted to a 15-minute firefight against the armed terrorist that resulted to the recovery of one (1) M16 rifle and wounding several others. These successful feats caused MajGen. Arthur I Tabaquero, commander of 8ID to express his appreciation to the civilian populace for the continuous show of concern and support. He also said that the successive successes of the troops can be attributed to the full support of the civilians. “While I congratulate the troops for the successful performance of their duty, may I also congratulate our civilians who are one way or another help accomplish our mission,” MajGen. Tabaquero uttered. “Election is fast approaching. This is the reason why the terrorist is doubling their effort in extortion activities in order to gain much finances for their selfless agenda. May I take this opportunity to remind our people not to give any sort of support to these terrorist in order to pave the way towards our dreams of a peaceful Region,” he added. He also said that it is not just an accomplishment of the 8ID. This is also an accomplishment of a united mind and body of all concerned individuals, agency and stakeholders who are pursuing peace and development for the province. TACLOBAN CITY – The Bureau of Internal Revenue in Region 8 is serious in its tax collection campaign. Headed by Regional Director Atty. Alert Alocilja, the BIR Eastern Visayas or BIR RR-14, recently padlocked three business establishments in Tacloban and another one in Calbayog City under its Oplan Kandado program. Ms. Paulina Buitizon, Revenue Officer 1, informed that the BIR has padlocked the Superstar Marketing and Warehouse situated at YKS Anibong District and two outlets of Red Roses Bakeshop located at Burgos St. and Rizal Avenue in downtown Tacloban City. The Superstar Marketing is the first business establishment to be padlocked this year, Director Alocilja said. It is engaged in brisk wholesale and retail trading and was found to have committed violations such as non-issuance of receipts and underdeclaration of more than 30% of its sales which are flagrant infractions of Section 115 of the National Internal Revenue Code of 1977, as amended, and salient provisions of Revenue Memorandum Order NO.3-2009. Armed with closure orders signed by Deputy Commissioner for Legal and Inspection Service Gregorio Cabantac, Director Alocilja served the order, ably assisted by Benny Asis Mari, RDO Imelda Cebuano, and Asst. RDO Jesusa Cabello together with the members of the enforcement team who recommended for the temporary closure. Meanwhile, in Calbayog City, Oplan Kandado closure was served on Uragon Everbuilt Trading, by Atty Edgar Quejada, RR-14 legal division chief and RDO Rolando Espina, together with the Revenue Enforcement team of Revenue District 87 based in Catbalogan City. The establishment committed more than 30% under declaration of sales involving P3 Million in deficiency taxes. Director Alocilja said that as of press time, the taxpayers, owners of the mentioned business establishments have already pledged to settle their respective tax obligations. TACLOBAN CITY – With the creation of the Leyte Provincial Anti Hunger Task Force just this week, the committee is bent in seeing to it that hunger and food shortages is prevented and addressed among the towns and city of the province. The Provincial Nutrition Council together with the Office of the Governor headed by Gov. Carlos Jericho Petilla formally organized Monday the Provincial Anti-Hunger Task Force (PAHTF) as per Executive Order No. 825 issued by President Gloria Macapagal Arroyo that will facilitate the implementation of the Accelerated Hunger-Mitigation Program (AHMP) at the local level, since the initiatives of National Government agencies should be complemented by similar efforts of local government units. As EO 825 came through, Gov. Petilla immediately ordered the formation of the provincial task force as part of the province’s commitment to eradicate all forms of deprivation, including hunger, by pursuing the achievement of the Millennium Development Goals. In implementing its hunger mitigation measures, Gov. Petilla said provincial government will build on its highly-efficient delivery of basic nutrition services which have already been started even before the task force was formed. The Provincial Anti Hunger Task Force has, for its members, the Office of the Governor through the governor himself, the Provincial Planning and Development Office, Provincial Nutrition Unit, Provincial Health Office, Provincial Population Office, Provincial Budget Office, Provincial Social Welfare and Development Office, Provincial Agriculture Office, Provincial Veterinary Office and the Local Office In-Charge of Livelihood or its equivalent. As members, their duties and responsibilities are to coordinate with the national and regional AHTF and oversee the implementation of the AHMP, and ensure the convergence of services delivered by national government agencies and LGUs. The members are also tasked to monitor the implementation of the Anti Hunger Mitigation Program (AHMP) provincial plan through preparation of monthly progress reports on the AHMP implementation for submission to the Regional AHTF through the National Nutrition Council Regional Office; conduct regular meetings to update implementation and o discuss and resolve implementation problems; conduct of annual program implementation review to assess accomplishments and gaps, regular project site visits and provision of feedback horizontally. Members are also expected to lead in advocacy for sustainable support to the program and to provide the public with regular updates on the AHMP and to recommend to the national task force policy and program adjustments to improve program efficiency. The heads of the various offices of the provincial government are further enjoined to ensure that hunger-mitigation programs are integrated in their respective plans, ensure their smooth implementation and advocate for their sustainability. The AHMP is the landmark program of the Arroyo Government to address hunger both on the aspect of supply or the unavailability or insufficiency of food to eat and on the aspect of demand or lack of money to buy food. CAMP LUKBAN, Catbalogan City – “Evil strikes back!”, are few but angry words from the victim’s bereaved family referring to the New People’s Army (NPA) for slaying and beheading their head of the family at Brgy. Genaronagan, Lope de Vega, Northern Samar the other day. Initial reports disclosed that Hon. Luis Durico, Brgy Chairman of the mentioned barangay was brutally killed by notorious NPA led by unidentified leader using assorted high powered fire arms while on his way going home from a barangay session meeting. Not contented with their brutality, the victim’s dead body was dragged towards the center of barangay and with the presence of his family and constituents, was beheaded to sow terror with them. It can be recalled that similar incident transpired at Brgy. Sta. Cruz, Matuguinao, Samar early this year when Arman Diaz of Brgy Madoroto, Matuginao, Samar was shot dead by five unidentified members of NPA and also dragged its dead body towards the center of barangay plaza to exhibit with the populace. Moreover, a certain Ka Dayokdok, former rebel who returned to the mainstream society revealed that the former group he previously belongs was responsible for killing and beheading a 13 year old girl that was also exhibited in the masses of San Jose de Buan for suspecting to be providing reports to the military without further investigation. This incident is no longer new in the underground movement since it was being condemned internationally for relentlessly violating human rights. Who will forget their nationwide anti-DPA campaign dubbed as, “Oplan Kadena de Amor, Missing-Link, Ahos-Zombie, Purga, Paglilinis-hanay, etc.” as a result of their “Kangaroo Court” butchering thousands of innocent member-victim? Who can’t recall the famous bloody “Digos Massacre” that came out to the public knowledge slaughtering even innocent children and beheading the UCCP pastor? Roberto Gacuma a.k.a. Ka Huling, the former top rank NPA official of Eastern Visayas Regional Party Committee (EVRPC) that was captured by the government forces sometime in 2007 has been exposing these un-Godly practices of his former comrades in most of his media interviews in order to warn those who are still being deceived by the local terrorist group. The people of Samar are already crying for justice and seeking help to the human rights groups especially to the Katungod-Sinirangang Bisayas and other progressive groups, that still doing nothing up to press time. “These un-Godly and barbaric acts of NPAs are no longer tolerable and must be given due attention”, cried out by his orphans. “May I inform our Samarnon that our task forces for peace and development are continuously exerting its effort to bring forth a secured environment that was long deprived by the insurgents in the province”, Major General Tabaquero added. TACLOBAN CITY – Top officials of the Leyte Norte Police Provincial Office briefed Governor Carlos Jericho Petilla on the security plans being made by the provincial PNP to ensure the sanctity of the May 10 elections during the Command Conference held at the LNPPO Headquarters here. The meeting, presided by Leyte Police Provincial Director Sr. Supt. John Sosito, revealed of the stepped up measure the police, including all of the municipal police stations under it, are doing to prevent any election related violence during this election period. Also, in the meeting it was revealed among others that five municipalities in the province have been identified as under the Election Watchlist. These are the towns of Tabontabon in the Second district, Calubian in the Third district, Kananga and Palompon in the Fourth District and Mahaplag in the Fifth District. No municipality in the First District appeared to be within the criteria given by the Comelec to be under the watchlist. However, Dir. Sosito said these areas pose no great threat to the peaceful conduct of the May polls as political alliances have already been made among vying candidates. No area in the province, he added, has been recommended to be placed under Comelec control. “These towns have been identified as under the watchlist as per the parameters given by the Comelec by which they are to be placed under watch; however, we saw that political alliances have been forged over the past months that can ensure a peaceful conduct of the elections,” Dir. Sosito said. Meanwhile, the provincial director also told the governor that according to intelligence report of the provincial PNP, there are two monitored private armed groups existing in the province and that the municipal stations have already been alerted on this organization. The tactical movement of all police forces during the campaign period, the creation and set up of the Election Monitoring Action Center cascaded down to the municipal level and the strict implementation of the gun ban were also discussed during the meeting. The Comelec Resolution 8646 prohibits the carrying of firearms, deadly weapons and even toy guns during the election period. Only uniformed police officers, military men and other law enforcement agencies are allowed to carry firearms. Likewise discussed was the security arrangement of candidates running in the local polls according to Comelec rules and regulations. TACLOBAN CITY – The fertility rate of the women in Eastern Visayas posted the highest nationwide at 4.3 live birth per woman. This was revealed during the regional data dissemination of the findings of the 2008 National Demographic and Health survey on March 4, at the Ritz Tower de Leyte. Region 8 tied with Regions IV-B or Mimaropa; XIII – Caraga; and Autonomous Region of Muslim Mindanao or ARMM. The region which has the lowest women fertility rate is that of the National Capital Region at 2.3, even lower than the national average rate of 3.3. The other regions with women fertility rates lower than the national average are Central Luzon or Region III at 3.0; Calabarzon or Region IV-A at 3.0; and Central Visayas at 3.2. NSO 8 Director Raul Dones said that although there is a slight decline from the past rate of 4.6, the current rate is still higher than the national level of 3.3 and the international fertility rate at replacement which is approximately between 2.0 to 2.5 children per woman, with extended threshold for developing countries depending on mortality rate. Director Dones said that TFR is one of the major indicators that can be generated from the results of the NDHS, indicators which can be utilized by other line agencies of the government and other organizations in the planning and direction of their programs mainly concerning public health. Director Dones added that the most commonly used measures of current fertility are the total fertility rate and its components, age-specific fertility rates. The TFR is a summary measure of fertility and can be interpreted as the number of births a woman would have, on average, at the end of her reproductive years if she experienced the currently prevailing ASFRs for women at the age bracket of 15-49. The 2008 NDHS was the ninth in a series of DHS nationwide sample surveys conducted at five year interval since 1968. It is designed to provide up-to-date information on fertility, family planning, maternal and child health, and other health issues of the country. CAMP LUKBAN, Catbalogan City, Samar – An untold graveyard of the NPA’s famous “Opan Ahos” was uncovered by the Army’s 63rd Infantry Battalion (63IB) at Sitio Hepat, Brgy. Cajecsan, Mondragon, Northern Samar, in the afternoon of March 6. Report reaching to this office from LtCol Joel Paloma, commanding officer, 63IB disclosed that the graveyard was discovered following a tip from civilian who have personal knowledge on the atrocities carried out by the terrorist sometime in 1980 as a result of their nationwide anti-DPA campaign. Four (4) skeletal remains were exhumed from three (3) different hollow pits of about a hundred meters apart. With the assistance of the local PNP and barangay officials, elements of 63IB exhumed the said skeletal remains for the family to give more decent burial. 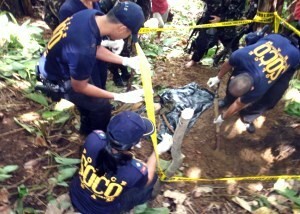 Dug up from the first pit is the skeletal remains that later identified as Modoy Martirez of Brgy. Cajecsan; Esmen Adriasola of Brgy San Agustin in the second pit while the father and son Francisco and Roque Tulin of Sitio Canawa, Brgy. Mirador owned the third pit. As of press time, troops is continuously conducting search and retrieval operation for more possible skeletal remains in the area in order to assist the victim’s family in giving decent burial to their love ones. “This is a clear manifestation of human rights violation that must definitely be given due attention and make the people or group behind this pay their blood debt against the law”, LtCol. Paloma added. Meanwhile, this incident call for the commander of 8ID, MajGen. Arthur Tabaquero to appeal to the local folks particularly those living in far flung areas to work hand-in-hand with the Army in order to unveil the mystery behind the atrocities of the Communist Terrorists. TACLOBAN CITY – The Search for Mr. and Ms. EVRAA 2010 which was held on March 12 at the DepEd Regional Teachers Training Center, kicked off this year’s regional sports fest under the auspices of the Eastern Visayas Regional Athletic Association. Chosen as Ms. EVRAA 2010 was Patty Burger of the Division of Biliran. She was crowned by DepEd Region 8 Regional Director Rose Marie Felicidad Saet and Atty. Tarcelo Sabarre, Jr.
On the other hand, Leyte Division’s John Trevor Crucero was crowned as Mr. EVRAA 2010 by Philippine Information Agency Region 8 Director Olive P. Tiu and DepEd ARD Alberto Escobarte. Ms. Burger and Mr. Crucero vested five other candidates in their respective categories, to win the most coveted title for the biggest annual regional sports fest. Proclaimed as the Ms. EVRAA and Mr. EVRAA first runners up were Jaclyn Grace Duzon and Arthur Casolan, both of the Ormoc City Division while Samar Division’s Harriet Ayala and Biliran’s Jean-Mitchel Francisco were cited as the second runners up. The candidates were judged not only for their over-all physique but for their talent, intelligence and communication skills and sports participation portfolio. Best in Regional Costume in the two categories were Ms. Patty Burger of Biliran and Mr. John Trevor Crucero of Leyte. Best in Sportswear were Jaclyn Grace Duzon and Arthur Casolan, both of the Ormoc City Division. Chosen as Best in Talent were Jaclyn Grace Duzon of Ormoc City Division and Ram Vincent B. Cosipag of Eastern Samar Division. The board of judges was composed of Atty. Tarcelo Sabarre, Jr., ABS-CBN Tacloban Manager Clifford Nolido and PIA Region 8 Director Olive P. Tiu who served as the chairperson. This year’s EVRAA hosts are the Divisions of Leyte, Ormoc City and Tacloban City. MANILA – The next administration does not have to raise existing tax rates, or impose new levies to bridge the budget deficit, administration vice presidential candidate Edu Manzano said. "The budget deficit is staggering, but not insurmountable. The next administration should be able to cover the deficit through highly improved governance – by reducing losses due to malfeasance, and by raising revenue-collection efficiency," Manzano said. Manzano's remarks came shortly after administration presidential candidate Gilberto "Gibo" Teodoro vowed to balance the budget by 2014, while his rival, Liberal Party presidential candidate Benigno "Noynoy" Aquino III, backtracked on his pledge not to raise taxes. Government expects to incur a P293-billion budget deficit this year. This is on top of the P298.5-billion and P68.1 billion deficits it incurred in 2009 and 2008, respectively. A budget deficit refers to the gap between government spending and income. "If we lessen by just one-half the annual losses on account of corruption, government would be richer by P120 billion every year," said Manzano, former national president of the Vice Mayors' League. Manzano, one-time vice mayor of Makati City, based his calculation on Office of the Ombudsman's estimate that the government has been losing some P240 billion of the annual national budget to shady deals. The potential savings from diminished corruption should be supplemented by greater tax effort, Manzano said. A mere one-percentage point increase in the tax effort translates to P12 billion in extra government revenues, he pointed out. The tax effort refers to revenue collection as a percentage of economic output, or gross domestic product (GDP). The country's tax effort has steadily declined in the last three years to just 12.8 percent of GDP in 2009. Economists have blamed the tax effort's decline on rampant corruption, a weaker economy and the passage of so-called revenue-eroding measures. "If the next administration raises the tax effort by four percentage points to 17 percent of GDP, which we already achieved before the Asian financial crisis in the late 1990s, government can easily amass an extra P48 billion," Manzano said. He cited the need for government to quickly build up tax enforcement and compliance.